STOCKTON — For a race that was hard to approach, John Moore looked like he had the smoothest ride at Stockton 99 Speedway on Saturday. 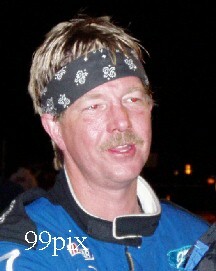 The Granite Bay driver led the entire race to win his first Western Late Model main since the death of his son J.D. 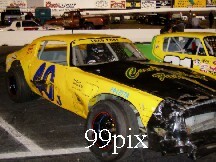 in a racing accident at the track in October. John Moore, #27, did his celebratory burnout in Turn 3 at the spot where his son crashed last year. "This is the most important one ever," Moore said. "The whole reason I'm even racing is to honor J.D. He was my whole world. I talk to him when I'm out there. I miss my boy." J.D. 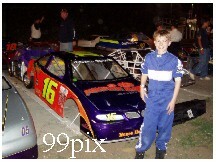 Moore was going to race Western Late Models alongside his father after he turned 16 during the season. 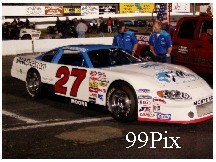 Instead, John Moore pits next to Allison Duncan, #20, his teammate with Bill McAnally Racing and the runner-up on Saturday. 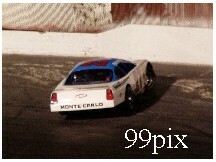 In only her second race at the track, Duncan, #20, stayed close, but could not get around Moore in the 30-lap main. She credited Moore with helping her since she joined the team as part of the McAnally/Richard Childress Racing Drive For Diversity program. "John is an incredible person to come out here and race after the tragedy with his son," Duncan said. "That shows a lot about him as a person and his character. I would have liked to win, but I couldn't be happier for John." It was Moore's third career victory at the track, seen by an announced crowd of 1,838. He also posted the fast time (14.347 seconds) and won the trophy dash, the first time he's swept points events. Moore said he had problems with the car all day, but felt like his son acted as his "guardian angel" as the car felt right just before qualifying. His crew made a small adjustment after the trophy dash, which kept the car from being too tight in the turns. "There was a vibration in the car that was really unnerving," Moore said. "It shook every lap like maybe there was a wheel out of balance. I forgot about it and kept going." He had to. Moore said every time he looked in his mirror, all he saw was Duncan's hood. 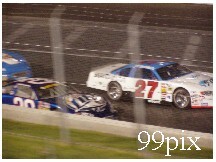 He was able to take a two-car lead late in the race by going under lapped traffic. 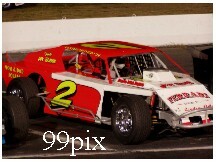 Former Stockton 99 Grand American Modified champ Marc Welch served as Moore's spotter and advised him to stay low the second half of the race. The strategy worked. "He was able to get by with a good spot and I had to wait half a lap," Duncan said. "I kept thinking to myself, 'How am I going to get by him?'" Ripon's #66,Mike Regelman was thinking the same thing in the 50-lap Grand American Modified race as he battled Salida's #2, Sammy Solari. 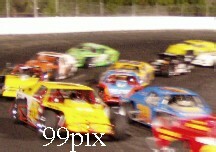 There were only eight cars left at the finish, the event slowed by five caution flags in the first 28 laps. Solari was pushed by Jay Linstroth, 10a, of Citrus Heights in the first half of the division's marathon. Linstroth left the race in Lap 28 with a busted fuel pump. Then Solari had to stay ahead of Regelman. "I had my hands full," Solari said. "I was better outside on the restarts so I tried to stay there. I didn't want to use up the car with 25 laps to go." Solari was pleased with his first performance of the year. 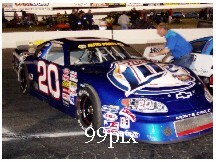 He was the third fastest qualifier and won the trophy dash in a car that is new for him, driving the No. 2 Ferrari Farms Grand Am. 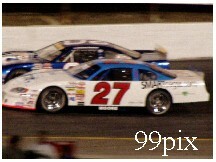 In the American Limited Stock Car main, Manteca's Johnny Cordoza, #40, won in front of Modesto's Charlie Clawson, who posted the fast time of the night. 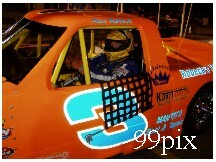 Ron Robeck of Milpitas won the Pro 4 Trucks main after posting a track record in qualifying (15.306). In the 30-lap California Mini Cup main, featuring drivers ages 8 to 15, Manteca's Jacob Gomes outlasted the pack in a caution-filled race. 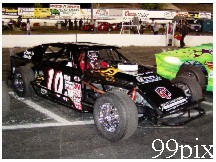 The Mini Cups are at Stockton 99 six more times this season, next on May 17. Gomes, 12, led most of the race. 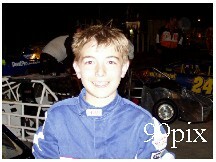 Brother Joshua, 10, finished eighth.